I don't know how I missed this at the time, but the Beer Barrel Man, the major league Brewers' version of our own Owgust, was featured on a Milwaukee Admirals stadium giveaway last winter. 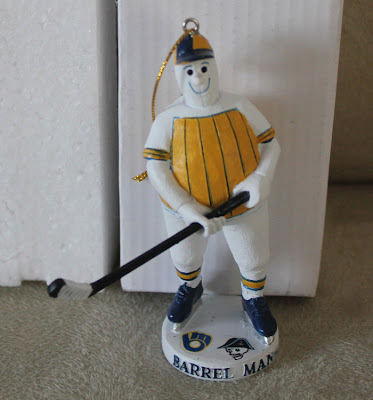 This resin ornament, standing about 4½ inches tall, was given to the first 2,500 fans who entered the Bradley Center for the Admirals/Grand Rapids Griffins game on Friday, December 9. Unlike the Brewers' 2009 bobblehead giveaway, which used my updated BBM concept rendering, this features the classic 1970s version. White barrel, white sleeves and all. Appropriate for hockey. The Brewers are a major sponsor of the Admirals, and some important figures within the baseball team's organization are part of the Admirals' ownership group, so there's a natural tie-in between the two franchises. I love that the BBM is on skates and carrying a hockey stick; it continues the long tradition of Owgust playing different positions on the diamond. He can hit, pitch, catch and play the field; why not try his hand at hockey? Who knows? 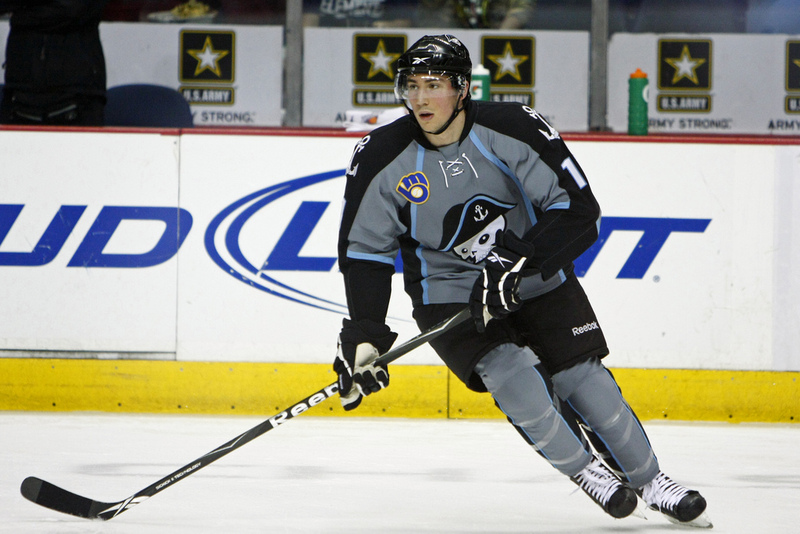 Perhaps the next time the Admirals have a special throwback event, we could try convincing them to wear a BBM patch rather than the ball-in-glove they usually sport.